The Guest may not be what you would expect if you’re familiar with Adam Wingard’s earlier genre films, Home Sick (2007), A Horrible Way to Die (2010) and You’re Next (2011). The Guest has a much lighter, amusing feel and sports a slick 80’s visual style complemented by a soundtrack that evokes that period. David [Dan Stevens] arrives at the Petersen’s Midwest family home where the mother is still grieving for her son who has been killed in combat. With David claiming to be a friend of the deceased soldier, any apprehensions she has as to who this stranger may be are quickly lost as she finds someone she can talk to about her son. Similarly, the rest of the Petersen’s lose any apprehension as David’s psychotic charm wins each of them over, with the guest knowing exactly what different style of personality works on the individual family members. The Guest is paced well with its only drawback being an ambiguity as to why events eventually spiral out of control, taking a short bathroom break at the wrong time could leave you mystified. Don’t over think Wingard’s latest exercise in genre film-making and just enjoy the film for what it is; a tongue in cheek homage to 80’s horror that will have you laughing rather than hiding behind your seat. 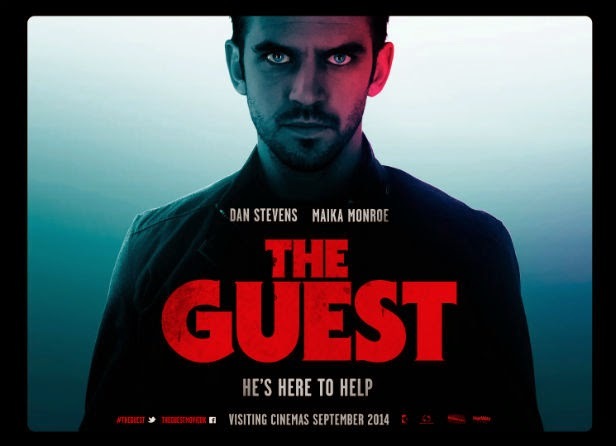 With a memorable soundtrack and beautiful visuals that in the last few scenes are reminiscent of Alice in Wonderland, The Guest is a deftly handled slice of entertainment.